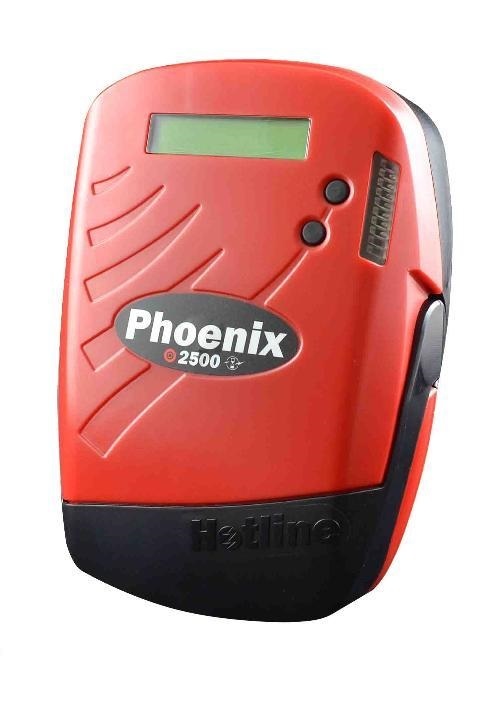 This Premium Hotline Energiser is a cost effective, high power fence energiser for all types of farm and equestrian use and as with all the mains powered Phoenix energisers, features a three colour LED 'status' bar graph, a menu driven LCD control and battery back-up facility. The LCD provides fingertip access to important fence information, displaying output voltage, return voltage, earth leakage voltage and stored energy. The status of the unit can be used to activate alarm outputs to warn of fence breaks, mains failure,fence shorts, battrey back-up low, earth voltage and low voltage. All of the Phoenix energisers feature a drop down cover, which safely conceals the terminals and protects the user from unexpected shocks. Stored Energy - 7-25 joules. Control - Menu driven with Large LCD display providing information on fence status. Visual - Front mounted LED Bar graph Fence Status Indicator. Other Features - Battery back-up facility, lightning protection, user configurable alarms - internal sounder and external alarm connector, drop down terminal cover. Connection Leads included:- Mains Connection Lead, Battery Backup Connection Leads. Can be wall mounted using the keyhole fixing points provided.